To celebrate the wonderful, Wood FX Birch, a KW Doggett stock that is really rustling the leaves of the design community, we recently got to do one of our favourite things – collaborate! Our brief from KW Doggett was “wood” and – wooden you know it? – we had some bright ideas about what we could do with that! Wood FX Birch is real wood that prints just like paper and has a white reverse. 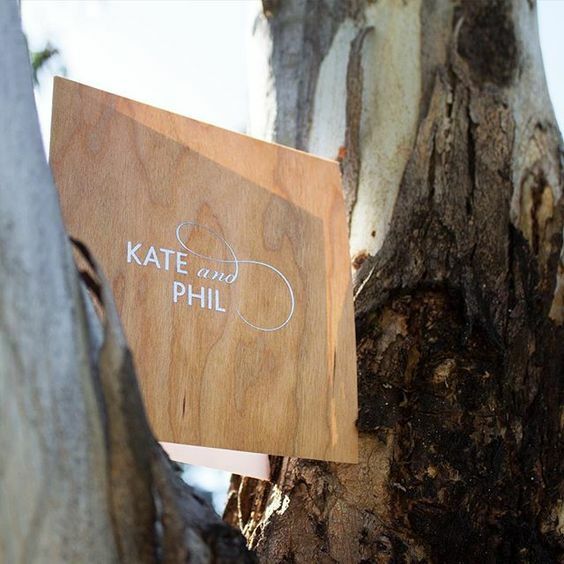 It’s a beautiful, printable wood veneer that lends itself to everything from eco business, vintage-themed projects, to outdoor weddings, and flexible enough for presentation folders, business cards, menus, and, of course, invitations. We foiled stamped the names on the wooden front in a gunmetal foil. Then, we mounted the reverse of the card to cotton stock and letterpress printed it. The bride and groom used the same front mounted to black white paper for their thank you cards. Woof FX is a unique and versatile stock, that can be letterpressed. It comes in both Birch (used for this project) and Cherry. We don’t want to get sappy (get it?) but we’re pretty excited about this innovation, that brings a lot of personality to print, and we can’t wait to work with more of it. Talk to us about how it can be used in your next creative project. We wood love to work with you on something amazing!